How much do your students know about the Mexican festival, Cinco de Mayo? Is it the Mexican Independence Day? What event in history does the festival commemorate? Ask fifth graders to mark the statements in this worksheet true or false based on their understanding of the festival. 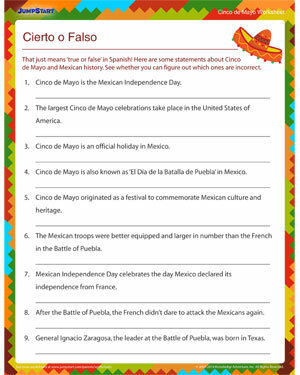 You can use this free and printable worksheet for Cinco de Mayo, or just to teach your students a little more about world history. The answer sheet provides extra information about each of the statements.